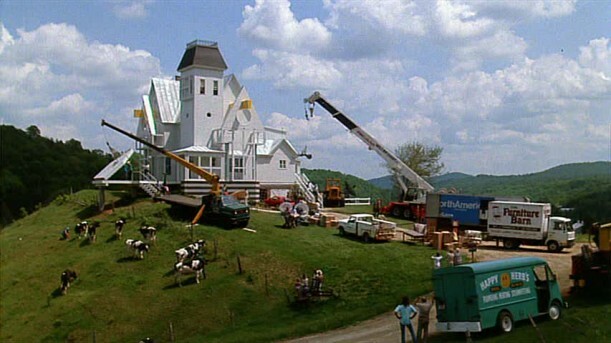 Tim Burton’s offbeat ghost story Beetlejuice took place in Connecticut, but it was actually filmed in East Corinth, Vermont. That great old house on a hill was just a facade built for the movie and later torn down. 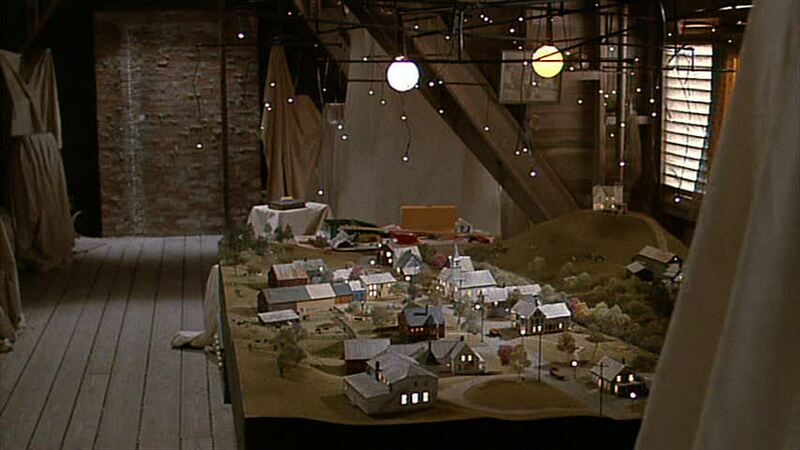 But when you watch the movie, you’d swear it had been overlooking the small village below for a hundred years. 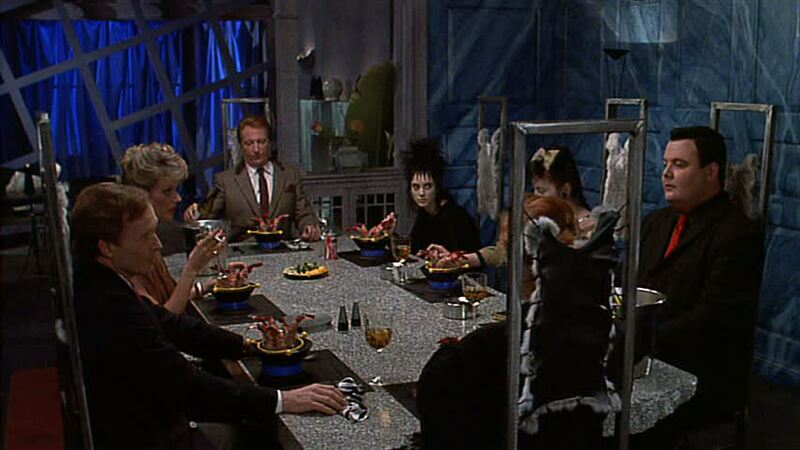 Since it’s Halloween month, I thought it would be fun to take a closer look at the Beetlejuice sets and how the house was transformed by its new owners into something memorably ’80s mod. 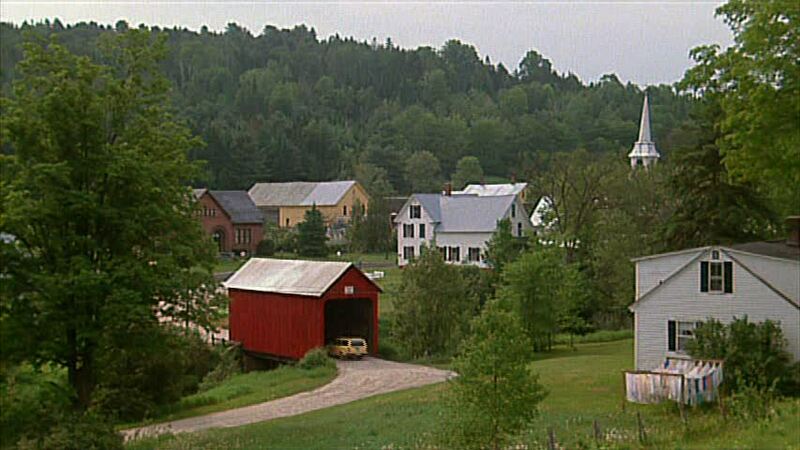 They built a fake red “cover” over the bridge (it was even a separate road that didn’t even lead to where they built the shell) that the Maitlands crashed through. I remember seeing the car go over the bridge (“all quiet on the set!”). The store, the library across the street, the mason hall that was the “school” all got fun little touches which were taken down after the shooting. 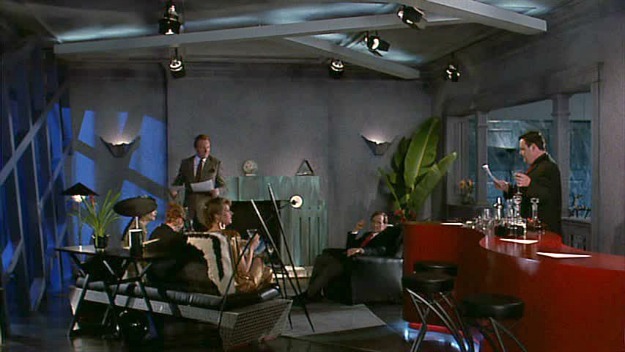 The interiors were created on a soundstage at Culver City Studios in California. 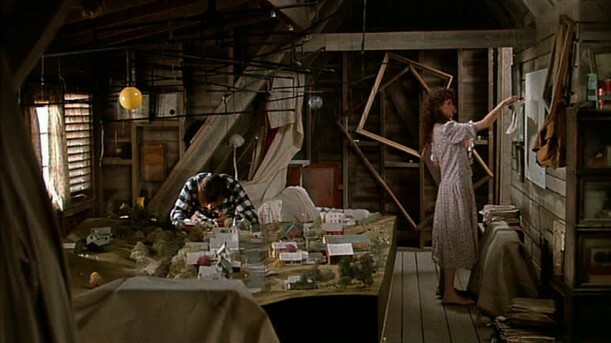 The sets were designed by Bo Welch, who worked as a production designer on other offbeat film projects like Edward Scissorhands and Men in Black. 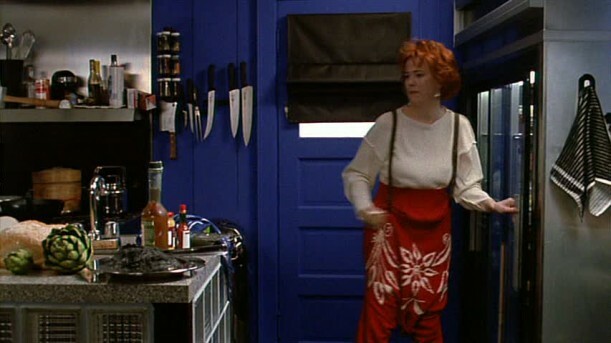 Welch is married to Catherine O’Hara, who played Delia Deetz in this movie. 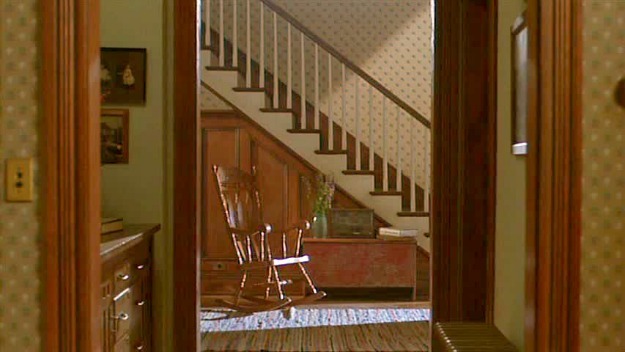 When Barbara and Adam were still alive, the house had a quaint, old-fashioned feel to it. But when the Deetz family moved in, all that soon changed. It’s been reported that Tim Burton originally wanted Sammy Davis Jr. to play the role of Betelgeuse, but studio execs insisted on Michael Keaton. Hard to imagine the movie without him. 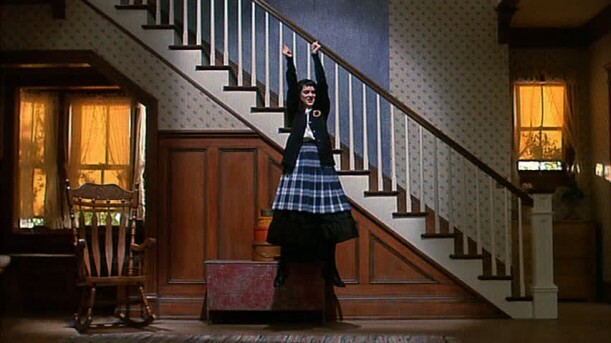 At the end of the movie, Winona Ryder levitates up the set and we get to see more of the staircase, which by then has been restored to its traditional look. 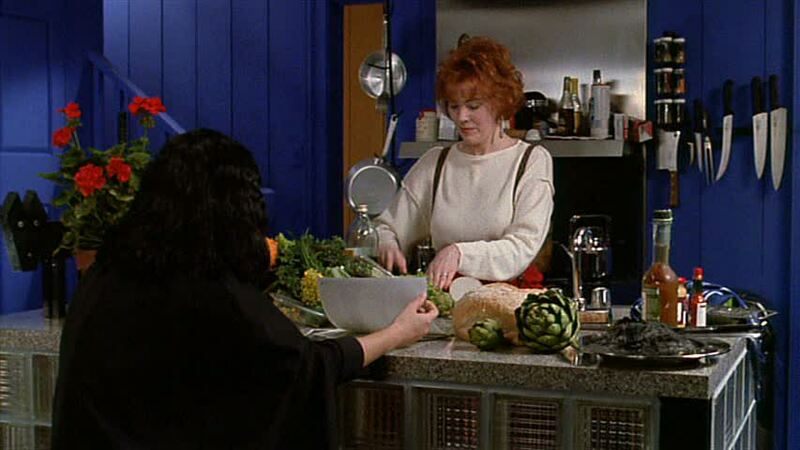 Anjelica Huston was reportedly cast as Delia Deetz first, but Catherine O’Hara took over for her. 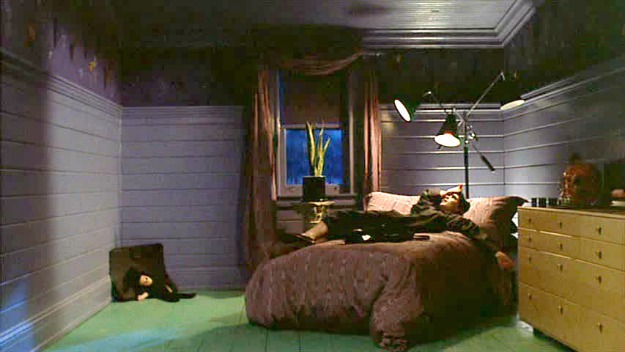 The house is almost comically “artistic” and edgy with gray walls and odd sculptures. 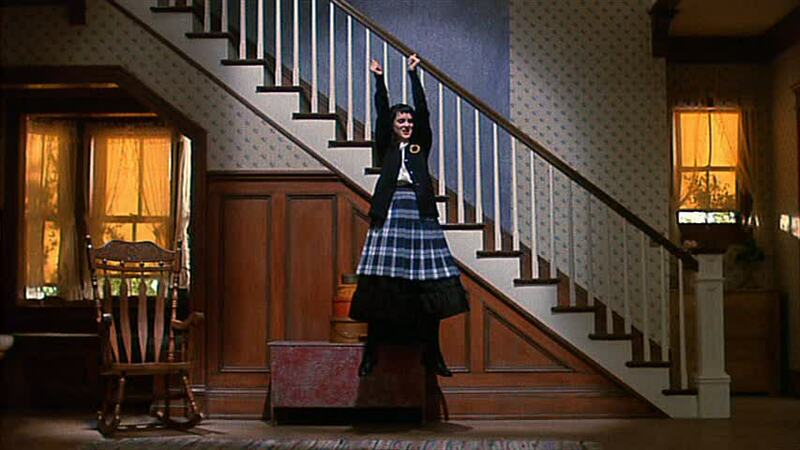 Winona Ryder played Lydia, their quirky daughter. She’s the only one who can see the ghosts in the house and communicate with them. I think this “deck” they created on the side is so cool–especially how that wall frames the view. 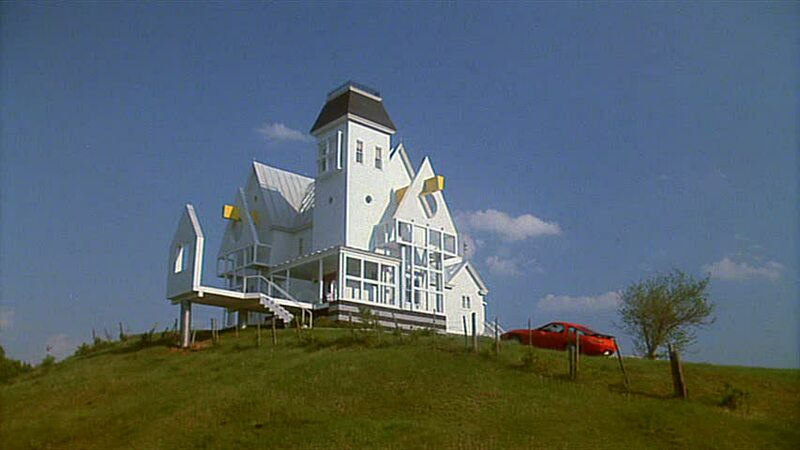 I know some people actually prefer the more modern version of the house. Are you one of them? Or do you cringe when they start remodeling it? Henry & Clare's House in "The Time Traveler's Wife"
I loved the “old” way the house was outside. Inside, I would have had to have a interior redesign! 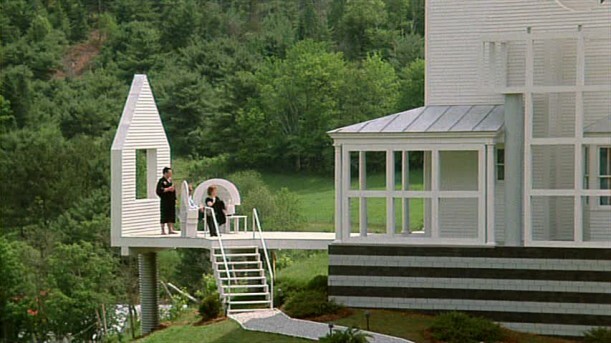 Its hard to believe it isn’t a real house! Fun post! I haven’t watched that movie in so long, but now I want to find it and watch it again! 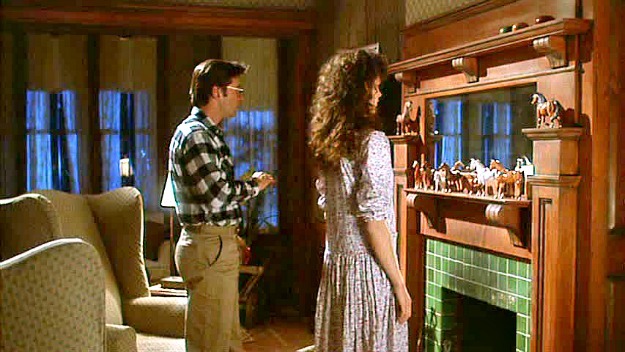 I don’t like the “modern” house remodel at all – it’s WAY more creepy than the old-fashioned look it had before. It is rare to see a Landscape Design cliche ripped into for humor. Here, the ‘after’ framed view? Proves the set designer is magically good. Everyone get’s the point. The “modern” version of the house is horrendous. I don’t even know what else to say about it. Ugh. I love the before, and it does have a 1950’s feel of an even older home. When my wife and I built our house in the country and the room above the garage was framed the front gable wall was built and the ridge beam tied it to the main roofline (before rafters were installed) . 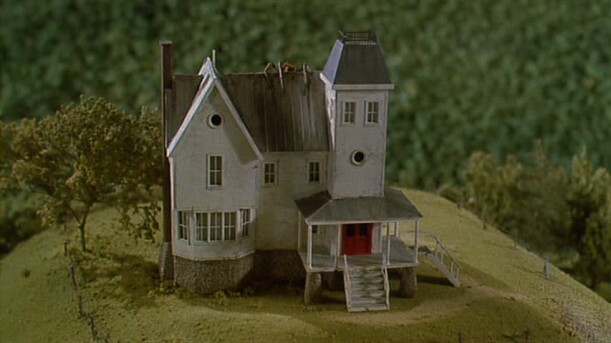 The kids both said we were building the Beetle Juice house. Too funny. Prefer the house before and thought it was hilarious watching Adam and Barbara’s reaction to what Delia had done to it. The cast was perfect, I cannot imagine anyone else in their roles. Alright, now I want to watch a few scary movies today. I love this time of year! Okay, now I have to include this one in our next Glitter and a Movie challenge. Must hurry before the month ends. It’s perfect. Great shots as usual. I love visiting your page and getting lost for a while. So dreamy. I actually didn’t like either the before or after exterior. 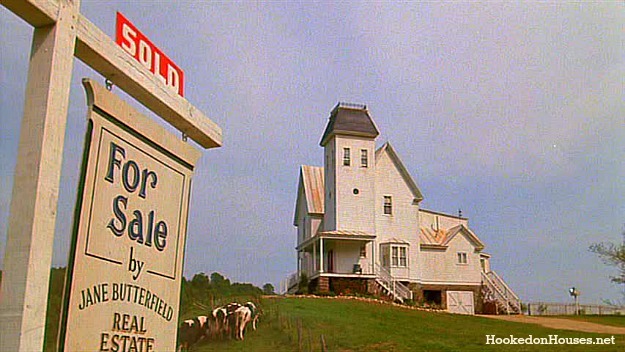 In fact, I was happy to read that it wasn’t real but a facade. I did love the original interior though. 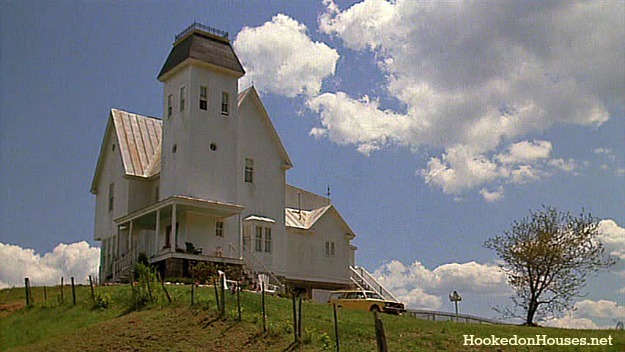 I remember yelling at the screen when I first saw the movie “What the @*#% are you doing to that beautiful old house? !” LOL! When I first saw this movie, I hated what the new homeowners did to the house. Now the after has grown on me and I find it interesting. It’s fun to look at, but I didn’t like either one of them. The original house needed work, but the after is just awful. Some of the exterior modifications are interesting, but then they take it way too far and ruin it. 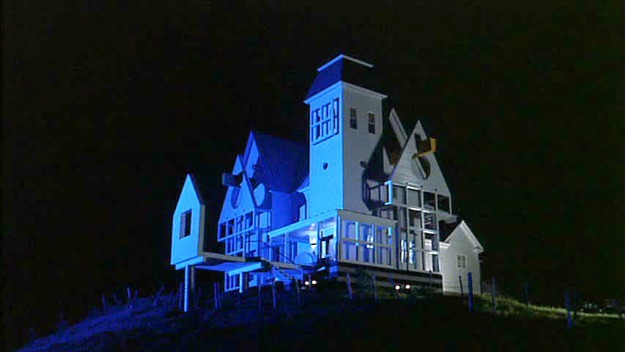 I’ve always thought the redo on this house was one of the funniest elements of the movie. It is hilariously bad and over-the-top and O’Hara’s loopy wanna-be-an-eccentric involvement in all of it just amps it up. 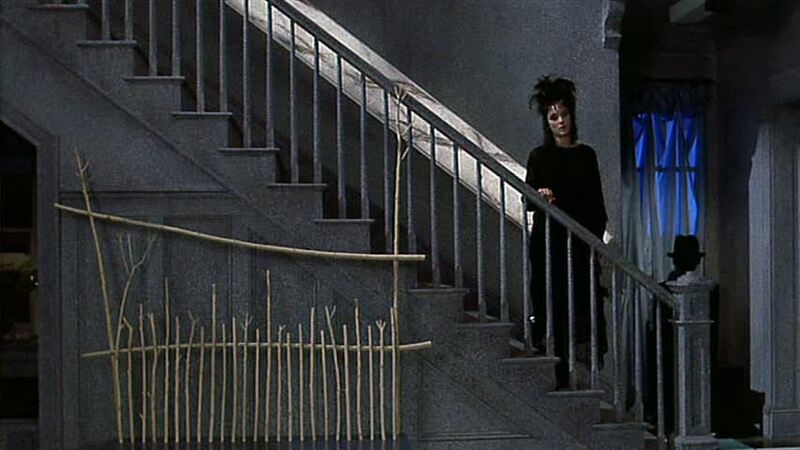 I think my favorite bad touch is the staircase, because it looks like it’s been spray painted with that “faux stone” product—a wooden staircase made to look like stone–LOL! Makes me laugh every time I see it. I still love Beetlejuice! I guess I cringe more at the makeover, just too extreme into those trends at the time. 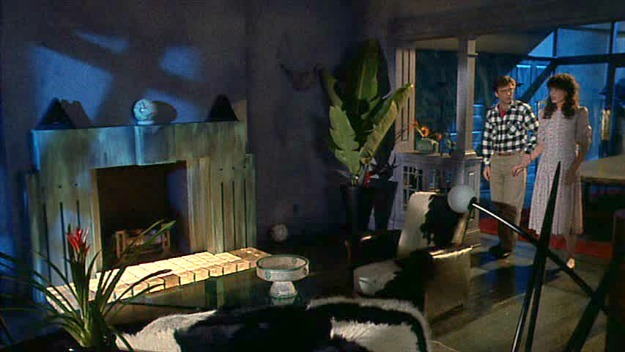 Although the cobalt blue kitchen and Lydia’s room kind of look interesting and perhaps fit trends now? 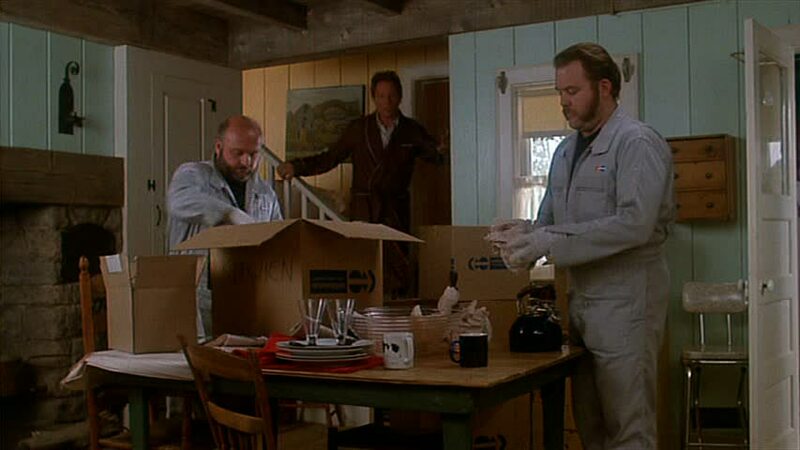 The farmhouse look wasn’t the best either, at least we know both were fake 🙂 I still can’t believe that is Michael Keaton, did you know that was his favorite role he’s ever played?!? This is when Post Modernism jumped the shark. That was the strangest movie ever! 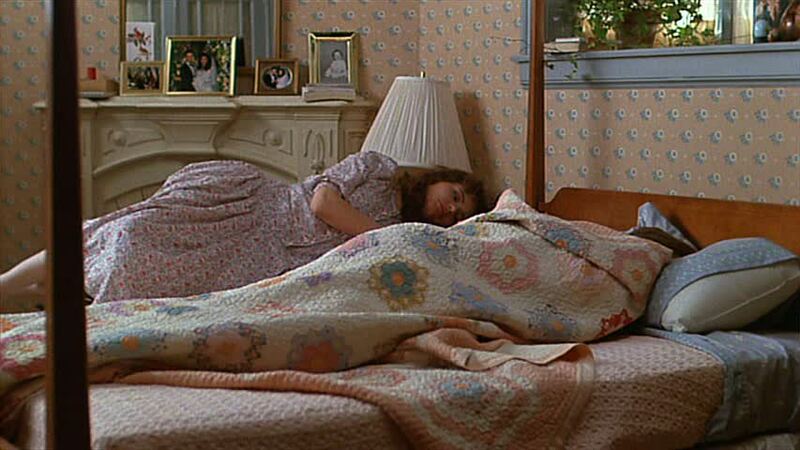 I love that movie, especially just how extremely “80’s” the house becomes. Hilarious! I must have watched that movie a 100 times as a kid. I always thought that house was goofy before and after! 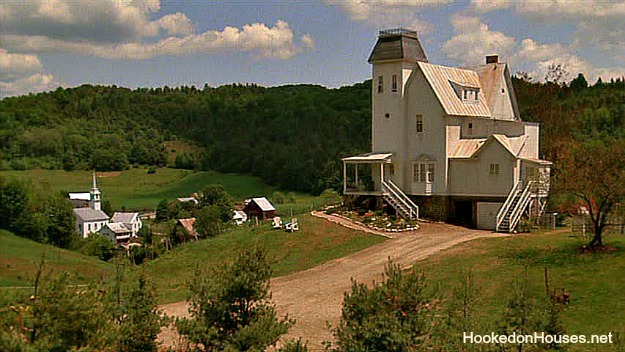 Can you imagine being in that tall pointy house on top of a hill during a lighting storm? Talk about a target, hope they had a lighting rod! Great film and great post. I loved the old one. But you’re right that the patio thing is awesome. 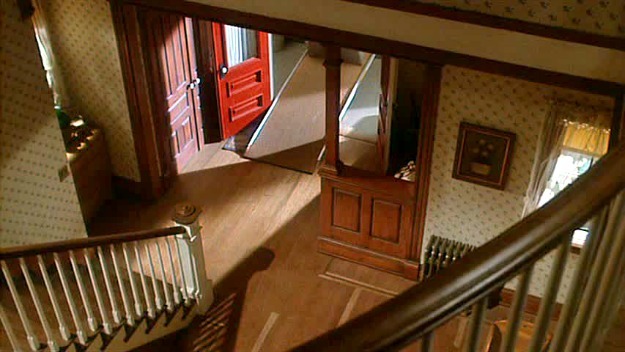 I adore the movie, and always felt that the renovated house was more horrifying and creepy than any other aspect of the film, including Beetlejuice. 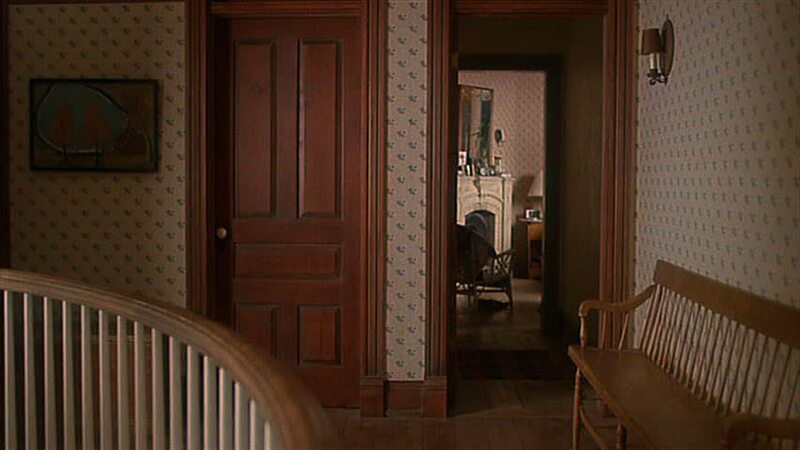 But as I look at those rooms and the exterior in these photos now, I realize that many of the old-fashioned houses in the Boston area, where I live, are being renovated by developers who must have been inspired by this film. I’ve seen so many real “updating” projects that are similar to the one in this film that the appalling changes in the movie house now strike me as typical. Sad. I loved this movie when I was a kid! We were new to cable television, and this played over and over on a particular movie channel. Even at the tender age of 12, I thought the remodel was a great example of everything that was wrong with modern design. Isn’t that too funny? The original farmhouse decor was – and still is – so appealing to me!! 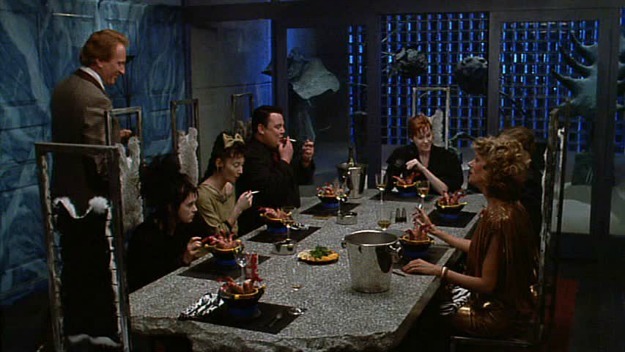 Love this movie – so quirky. Love the characters, esp. Catherine O’Hara. Ugly what they did to the house, but fitting for the movie – had to be extremely “contemporary goth” to fit the Deetzes’ personalities. 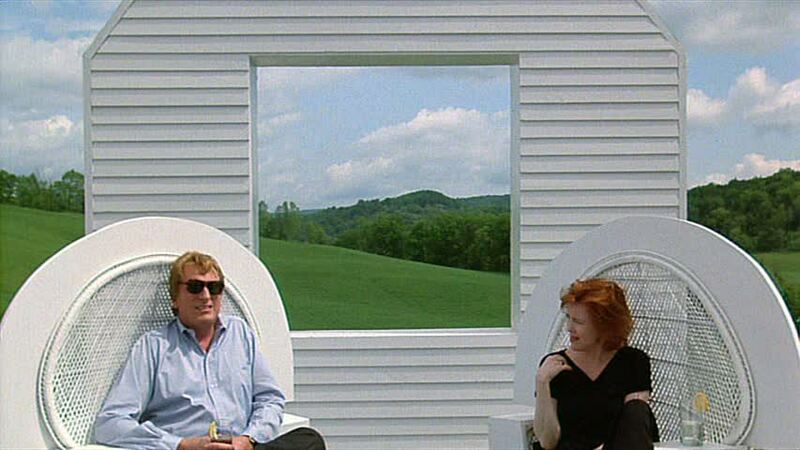 I’d like to watch it again now and pay more attention to the design and the sets! Thanks for sharing! I do agree with you on how neet the wall frames the veiw though.